The free Employment Situation Summary template is the perfect tool to help you look up and store information about Household Data of employment, brought to you by the Bureau of Labor Statistics. From 2015 to 2016, you can look up employment data across the country and narrow down your searches by gender, race, age, and other criteria of your choosing. You can use this data for reports or your own business purposes. These figures are reliable and free to use. The Excel format of the template also makes it easier to find the exact information you need. To get started today, just follow the directions below. To download, follow the link provided below. The template itself is broken into 7 different sections. You will see them separated by a blue line that calculates the total of the previous section. The first column simply tells you the topic and if you scroll over, you will see the data for that category. For example, the first item is employment information for the civilian “non-institutional” population. 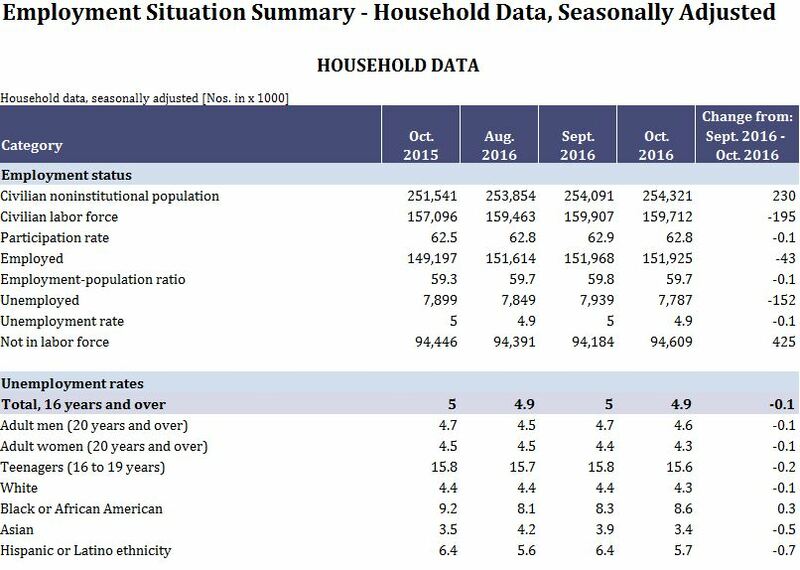 You can see that the employment figures for that category in Oct. 2015 were 251,541,000 and steadily rose each month. As stated above, each section is broken down by topic. The first section had employment status, and the second section is for unemployment rates of the past 16 years. If you want to see the reason for employment, simply go to the 4th table of the template and see the reasons given. This table shows the reasons people become unemployed and what percentage of each reason make up the total unemployment rate. For example, some left because jobs were temporary, some left their job, and some were fired. This template has everything you need to view employment data from 2016 so you can use it for any purpose.